After College, International Students Have To Leap Hurdles To Stay In U.S. : NPR Ed With a recent U.S. degree in hand, many international students are left to navigate the complicated immigration system by themselves. Huang Yimeng was disoriented when she learned that her U.S. visa was denied last November. It meant the recent University of Virginia graduate wouldn't be returning to the U.S. to continue her work at McKinsey & Co., a consulting firm. She was in Shanghai when she got the news, having bought a return ticket and leaving most of her belongings in her apartment in the U.S.
"I thought about the yellow towel in my new kitchen, the toy shark from IKEA I have kept for five years ..." Huang wrote in a blog post, translated here from Chinese, "but the key will never turn in the lock again." When international students like Huang graduate from U.S. colleges and stay in the country to work, they have a few visa options. If they want to stay short-term — one to three years — there's Optional Practical Training (OPT), an authorization granted by U.S. immigration authorities that allows students to work in their field of study, as an extension of their student visa. The number of students approved for OPT has surged in recent years, according to a recent Pew Research Center report. For those who want to stay longer, there's the H-1B visa: an employer-sponsored visa that in most cases allows students to work for up to six years in the U.S. Following the Trump administration's executive order last spring encouraging employers to "hire American," the U.S. Citizenship and Immigration Services has requested further information from a rising number of H-1B applicants, lengthening their time of uncertainty as they wait for word about whether they can stay and work in the U.S. This includes international students like Huang, the UVA grad hoping to start her new job. There is no data available to show if this is happening more frequently to international students than it was under the prior administration. But it's always been hard to stay in the U.S. after graduation as an international student. For most people, it starts — or ends — with a lottery system. The U.S. awards a limited number of H-1B visas to the vast majority of employers — but there are often far more applicants, hence the lottery system. In the past three years, the average chance of winning this lottery has been below 40 percent. This year, the number of applicants is down — which makes the odds of getting in a bit higher. To even enter the H-1B lottery, students have to first find a company that is willing to take a chance on them and sponsor their visa. Most companies won't take that chance. Less than one-fourth of employers plan to hire international students in 2018, hitting a new low and continuing a downward trend, a survey by National Association of Colleges and Employers shows. Peng Yuhang, an electrical engineering student from China, recently graduated from Northwestern University in Evanston, Illinois. He received near daily calls from companies when he posted his resume on a job seeking website. But once they found out that his work authorization — OPT — will expire in a little less than three years? "Some people would hang up the phone the moment you said you need sponsorship," recalls Peng. He eventually found a job — he's waiting to see if he makes it through the lottery before he knows he can stick around. While many international students studying here want to pursue a career in the U.S. after they graduate, they compete with a global, often more experienced workforce to get an H-1B visa. 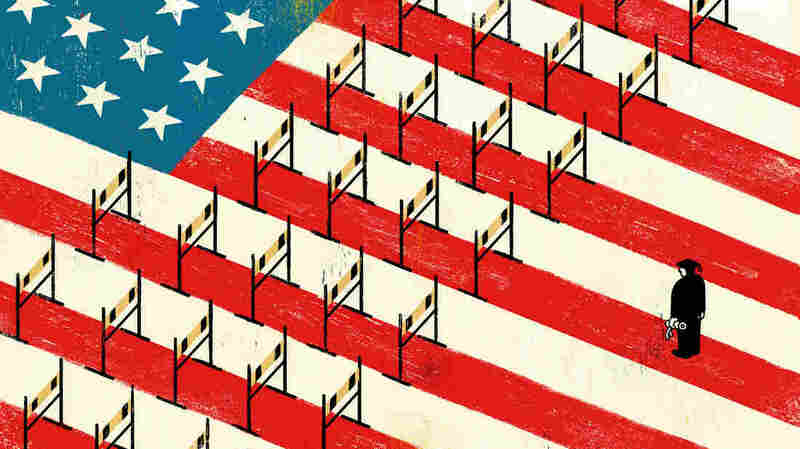 Firms that recruit job candidates outside the U.S. also flood the H-1B system with petitions. The Trump administration has said they want to make it harder for these firms to contract international employees to U.S. companies. Data on how many international students transition from student status to work status is not readily available. A 2013 Brookings Institute report showed that 35 percent of that year's H-1B visas went to international students. "The United States' legal immigration system reflects a lot of demands — desire to bring family, refugee resettlements, introducing talent," says Steven Camarota, the director of research for the Center for Immigration Studies, which advocates for restrictions on immigration. "You also have to balance job competitiveness, the school system ... if you have more foreign students stay, you'll have to revisit all of those issues." "[American] universities tend to be the best in the world, so the foreign students that come here to study tend to be the best or at least very good compared to students in their home countries," says Alex Nowrasteh, senior immigration policy analyst at the Cato Institute, a libertarian think tank. "It will be tremendously positive for the United States to have a group of educated, English-speaking, highly trained, intelligent people to live and work here," Nowrasteh says. "You just told me something new." U.S. Citizenship and Immigration Services, the authority in charge of visas, announced early April that it had received enough petitions to conduct the H-1B lottery for this year. But Oluwa-Pelumi Oluwalana of Nigeria wasn't even aware that the lottery was going to happen in April. "WHAT???" he yelled when I told him. Oluwalana had been working at a law firm since he graduated from Howard University in May 2017. He hadn't asked his employer to sponsor him. That meant he had no chance of getting an H-1B this year. The finance major is going back to graduate school this fall. "WHAT???" he yelled again after I asked him if he knew he'd have to wait at least six months to start working if he didn't have other legal status to work in the U.S. after the lottery. Immigration rules dictate this and many employers aren't willing to wait. Not everyone missed the lottery dates. Most STEM students and students in touch with large international communities tend to understand the process better. University administration and fellow international students can help out the new arrivals. "The engineering students ... have friends who have already been here. And they discuss their plans well before they come here," says Vivek Wadhwa, a fellow and professor at Carnegie Mellon University's College of Engineering. "The engineering school has advisors, teachers who would guide them through the process, who connect them to companies and lawyers and so on." The University of Illinois at Urbana-Champaign has a large number of international students — as of fall 2017, more than 1,000 were from South Korea. Last fall, the university invited a Korean-speaking lawyer to explain immigration law to Korean students, according to Un Yeong Park, assistant director for career and professional development for international students at Urbana-Champaign. Students without the network of support have to fend for themselves. Across majors and nationalities, students I spoke with were confused about things like what kind of visa they could apply to, what kinds of employers could employ them, or what the application timeline might look like. Universities and colleges say they don't have the obligation to inform international students of H-1B or other work-related visas beyond OPT. Many employers are also at a loss. In some cases, international students even guide employers or potential employers who aren't used to hiring international students. Can't you just Google the info? Well, no. There's a ton of misinformation out there. Experts recommend getting help from an immigration attorney. "[The immigration system] is not a crossword puzzle. It's risky to not get a consultation," says Leslie Dellon, a staff attorney at American Immigration Council, who spent several years filing H-1B petitions for employers. She no longer files for those visas, but still understands the complexities of the process. Few international students have had one-on-one consultations with lawyers. Most of them either said it's unnecessary or too expensive. A previous version of this story incorrectly said Huang Yimeng was waiting to return to the U.S. to start her job. She was, in fact, already working at McKinsey and was waiting to return to continue her work.